Have you ever had one of them days where you wish you just stayed in bed? That was me this morning.... Jeff puts his glass of iced tea back in the refrigerator if he does not finish it all and while trying to fit something in the fridge, I managed to knock it over and spill it everywhere. About 10 minutes after that, while trying to eat lunch, instead of crunching down on the piece of apple, I bit my tongue instead... So after 20 minutes of waiting for it to stop bleeding, I was ready to just call it a day and go back to bed. Since it is Tuesday though, I had to get something together for Jeff to bring into the office for Wednesday treat day, so I cleared my head and went on with the rest of the day. 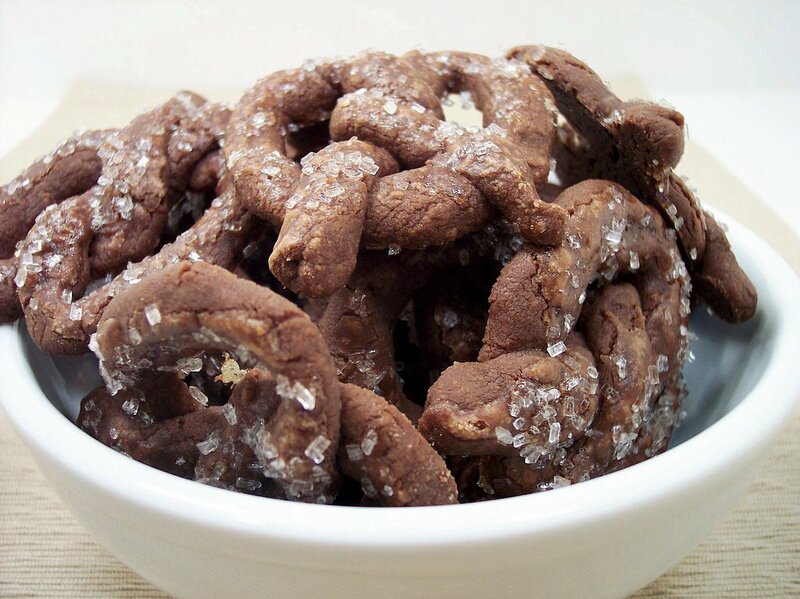 The recipe I picked out to make for him to bring in tomorrow is Chocolate Pretzel Cookies. I've been meaning to try out this cookie since I first went through the King Arthur Flour Cookie Companion. It is a simple ice box chocolate sugar cookie that is rolled into a long rope and then shaped into a pretzel. An egg white glaze is brushed over the top and a some coarse sugar crystals are sprinkled on. Baked until firm, these cookies held their shape well and have an intense chocolate taste from the dutch process cocoa. The coarse crystals not only add a sparkle, they bring a nice crunch on top. I didn't have to worry much about tonight's dinner as it was put together yesterday. Strata Milano with Gorgonzola uses the bread I mentioned on Sunday's post. 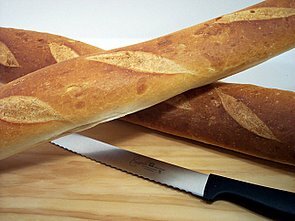 Sourdough bread is sliced, toasted, and then allowed to sit in a flavorful cheesy egg mixture overnight. Ricotta and gorgonzola bring a salty richness to the sour bread. 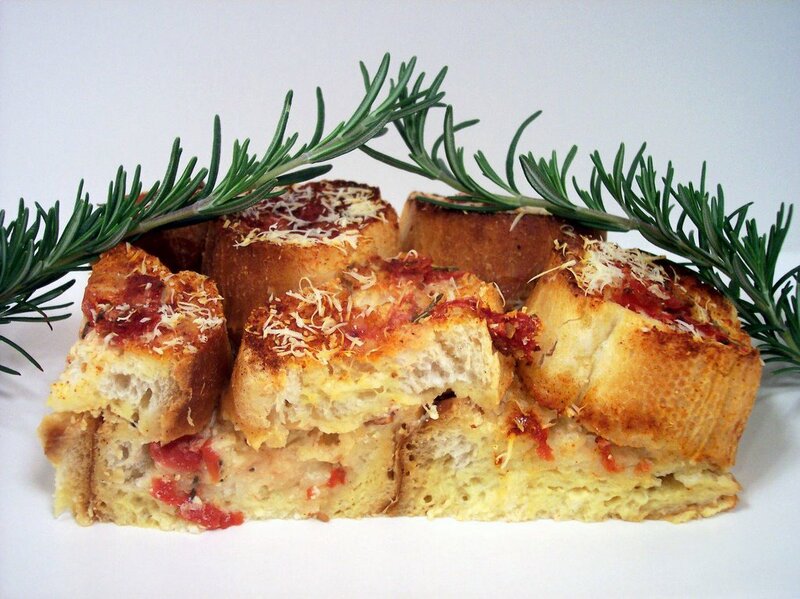 Smoky bacon and rosemary flavor the plum tomatoes which are layered inside and on top of the crusty toasted bread. The bottom layer soaks up most of the egg mixture and softens a bit, while the top layer takes on a deep golden brown color and stays quite crisp. It looked kinda funky while it was being put together, but after it was baked I liked the unique appearance. 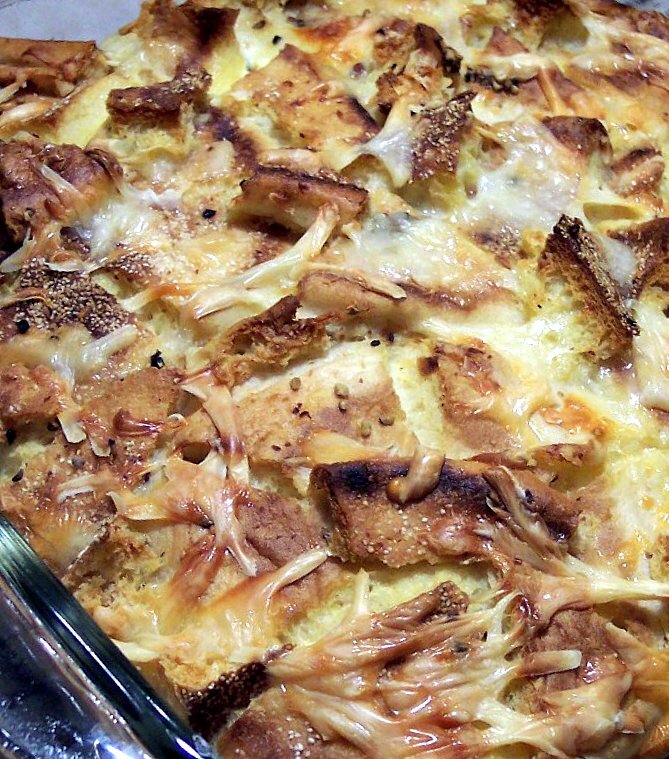 This dish reminded me of the Bread Pudding Florentine we made some time ago. Today was pretty busy so we had a couple of light items for dinner tonight. I was looking for something that would be pretty filling, but not heavy. To start us off I made White Cheddar and Black Pepper Biscuits. I wish I would have made a double batch of these just to put one set in the freezer. 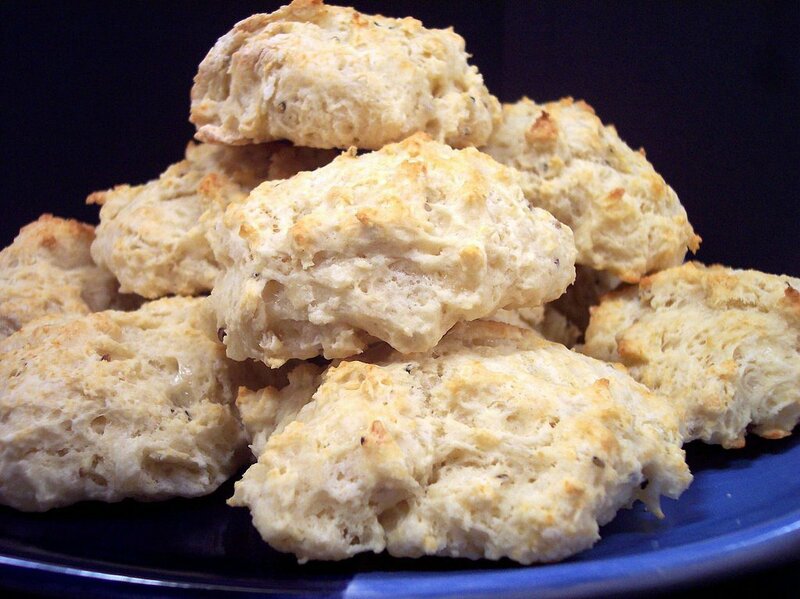 The tender biscuits, made with buttermilk, have a sharpness from white cheddar and just the right amount of bite from the pepper. I was afraid there would be an aftertaste of baking powder since there is quite a bit in the recipe, but neither of us detected it. Instead of rolling and cutting them, I decided to speed things up and just turn them into drop biscuits. Since most of the work is done in the food processor, these can be whipped up in no time. 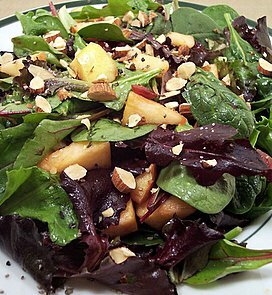 Keeping with the light, but filling theme, we went with Apple, Almond, and Mixed Greens Salad with Zinfandel-Cranberry Vinaigrette. The fresh tasting dressing is made from cranberry juice, zinfandel, lemon juice, shallots and olive oil. Dried cranberries burst with flavor when bitten into as they were plumped up by steeping them in boiling apple juice. Crisp apples bring a nice contrast in texture to the tender baby greens. 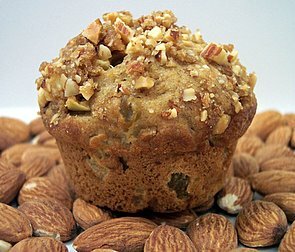 Toasting the almonds brings out much more of the nutty flavor which allows the serving size to be small, but they still pack a punch. Next time I would include some gorgonzola or another type of crumbly cheese to add another dimension. We did a little better this week, with 11 new recipes. I quite enjoyed most of them, but I think the stand-outs were the Creamed Cauliflower with Herbed Crumb Topping and Breakfast Crunch Bars. The new week has some fun and comforting recipes coming up - I can't wait to get started as we roll into another month. Here's a peak at one of the ingredients we will be using in a recipe at some point during the week. A few of the other ingredients that will go along with these crusty Sourdough Baguettes are fresh tomatoes, baby spinach, and gorgonzola. The movie from Netflix tonight will be The Pacifier starring Vin Diesel and Brad Garrett. Going over the list of recipes to make this week, I see it will be quite busy as some require a lot of prep work to be done the day before. Stick around and see what we end up with! It has been awhile since the last time we have made brownies. 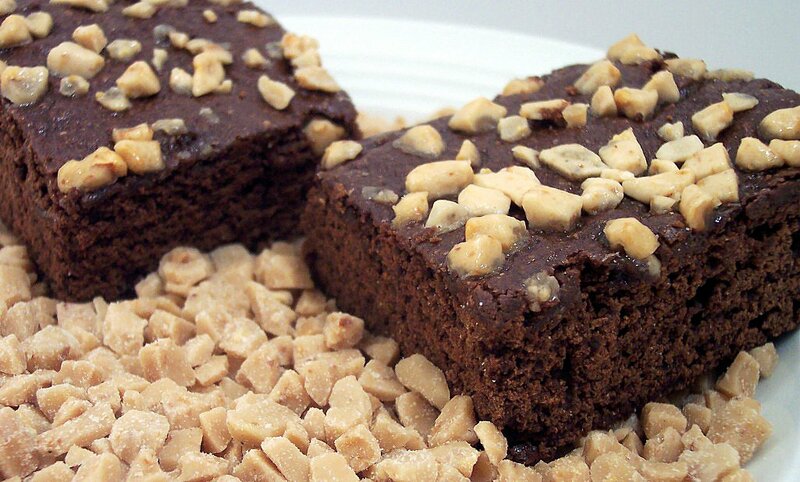 As I said then, we prefer the fudgier brownies more-so than cakey ones. Even though the brownie we made today was very moist, the title of this recipe is a little deceptive. I did take them out a couple minutes before the stated baking time, but they ended up with a different texture that I was expecting. Fudgy Mocha-Toffee Brownies have a rich flavor and while the texture was lacking for me, it was still very good. The mocha part is very subtle as it is just there to beef up the chocolate taste. I used toffee bits without the chocolate coating, but I think they could be better with the coated ones. They reminded me a lot of the ones you might find in the snack isle of a grocery store. 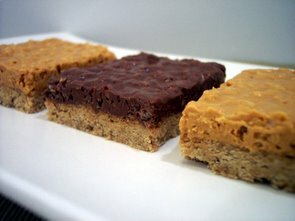 I would make these again as they were pretty good for being a brownie on the lighter side! Tonight's weekend movie from Netflix is Millions. Was this even released in theaters? I don't ever remember seeing anything about it. I think this is the first week that I have not added anything to my to-try pile, so it did go down a few this time! I have a feeling that will change this week with new magazines coming in. Unlike some soups in the we have made in the past, the one tonight does take quite a bit from start to finish to make. You can speed things up a little by preparing the veggies early and leaving them in the refrigerator until you are ready. Roasted Vegetable-Rosemary Chicken Soup intensifies the flavor of the veggies by roasting them until they are caramelized. Since I love the flavor of roasted garlic, I added a couple whole garlic cloves along with some sprigs of fresh rosemary for some additional flavor while they cooked. 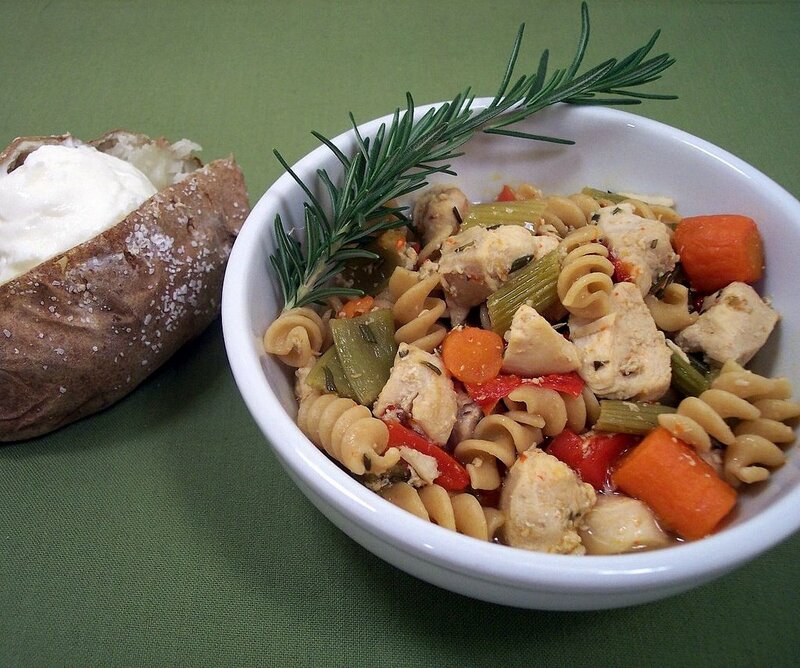 You can start cooking the chicken in a flavor-filled mixture of water, chicken broth, fresh rosemary and garlic while you wait on the vegetables. When the veggies have enough color, the two are then combined and allowed to simmer to meld the flavors together. Just before serving, whole wheat rotini is added, which soaks up the intensely rich and potent liquid as it softens. Much of the liquid evaporates or is used up by the pasta and there is not that much left when serving. I would think about adding some more liquid next time so it is more of a soup. I found it to be very filling and provided a generous amount of pasta when portioned into 4 servings. We both agreed that this was probably the most flavorful soup we have made to date. Jeff requested baked potatoes to go along with the soup tonight. On the baking front today was some more muffins... I pulled out the last one I had in the freezer for a snack today. Most muffins freeze quite well and it's nice to have a good supply for snacks as they thaw pretty fast. This time around I made Fruit studded Muffins with Almond Streusel. 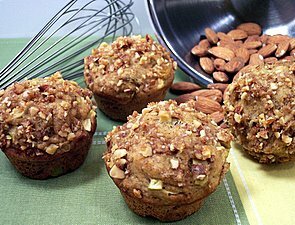 The muffins are quite healthy - filled with ground flaxseeds, whole wheat pastry flour, orange juice, fresh apples and golden raisins. I found them to be moist and a little dense, but not so much heavy. They are slightly sweet with the nutty crowns bringing a crunchy texture difference. I made 14 muffins, but you could stretch them a little more and still have pretty large muffins. Whew! Tonight's dinner was pretty spicy. Kung Pao Chicken is heavy on the ginger with a thick sauce that I served over a bed of brown and wild rice blend to soak up some of the liquid. 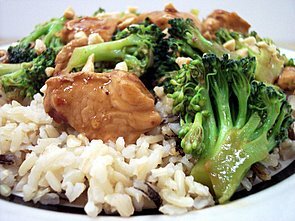 Crisp tender broccoli and juicy chicken bites are coated in a spicy mix of garlic, ginger, red pepper flakes, hoisin, soy sauce, chicken broth and soy sauce. Crunchy peanuts are thrown on top to go along with the nutty rice. This takes just a few minutes to throw together and is perfect for a quick weeknight meal. 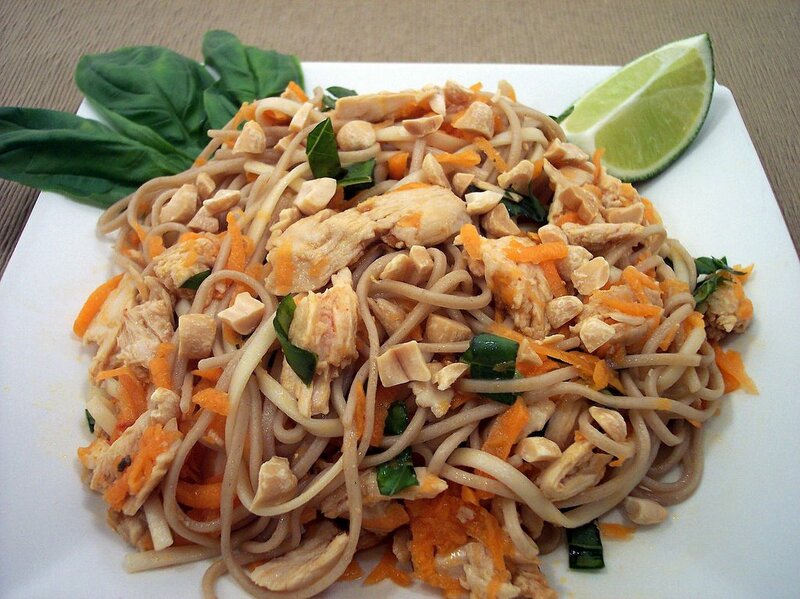 I would add more veggies (maybe carrots and red bell) next time and use cashews for the nuts. Well it has been just over a month since the last time I had some puppies dancing around the oven waiting for their treats to come out. They have been out of treats since Monday, so I figured I better get them done today or they would have been whining all weekend. I was very happy how the dough turned out for the Cheesy Herb Biscuits. 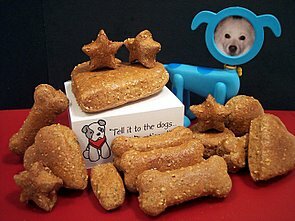 They are a little different from previous biscuits we have made as these have yeast in them. They are flavored with chicken broth, fresh grated parmesan cheese, parsley, oregano, and garlic. 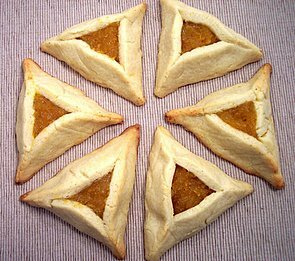 The use of whole wheat flour, rye flour and cracked wheat gave them a great texture. The dough was easy to roll out as long as you give it a few minutes to relax after kneading. Even though there is no rising time, you get quite a bit of lift in the oven. You can bring these together pretty quick and cut them out with whatever cutter you like. Midway through baking, they are taken out from the oven and an egg wash is brushed on both sides which gives them a glistening coating. They are returned to finish baking for about 30 minutes and will become quite crisp. They smelled quite good while baking and had the dogs pacing for their chance to try and sneak a bite! I'm guessing they were good because as I was trying to package them up, one fell on the floor and Max would not give it back. Tonight's dinner was more of a side item turned into a main dish. Creamed Cauliflower with Herbed Crumb Topping turned out to be very surprising hit! The last time we had Cauliflower, I was satisfied I found my favorite way to prepare it, but this dish ranks right up there. 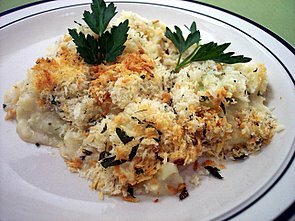 The tender cauliflower is coated in a thick Parmigiano-Reggiano cheese sauce and then topped off with fresh breadcrumbs. The sourdough flavored crumbs are mixed with melted butter, garlic and fresh herbs to create a pretty close version of Garlic bread - only in a crunchy breadcrumb form. This is baked until the creamy inside starts to bubble and the topping turns a deep golden brown - not too much fuss for such a flavorful meal. It's that time again... the baking of goodies for Jeff to bring in to his coworkers for Wednesday Treat Day. Like last week, I ended up choosing a bar cookie. This one, despite the name, is a little too rich to eat at breakfast. 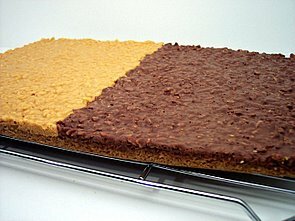 The recipe's name, Breakfast Crunch Bars, is not suggesting to eat them at breakfast, rather it is more of a description of one ingredient used. Breakfast comes from the use of a morning cereal - Rice Krispies. If you are a fan of peanut butter, I highly recommend this recipe as it has 1 1/2 cups throughout! 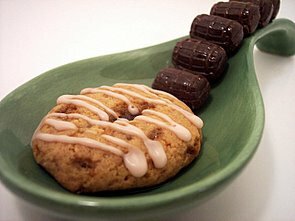 The cookie starts out as a buttery base with a rich peanut butter flavor. Dark chocolate and peanut butter are melted together in one bowl and Butterscotch chips with more peanut butter are melted in another. Rice Krispies are mixed into both and then each is spread onto half of the large base. The bars do take awhile to set up, but can be cleanly cut into squares once ready. The Rice Krispies stay very crunchy and I like how each side has it's own intense flavor. Next time I might divide the chocolate/butterscotch mixture into stripes so you get a little of each in the squares. 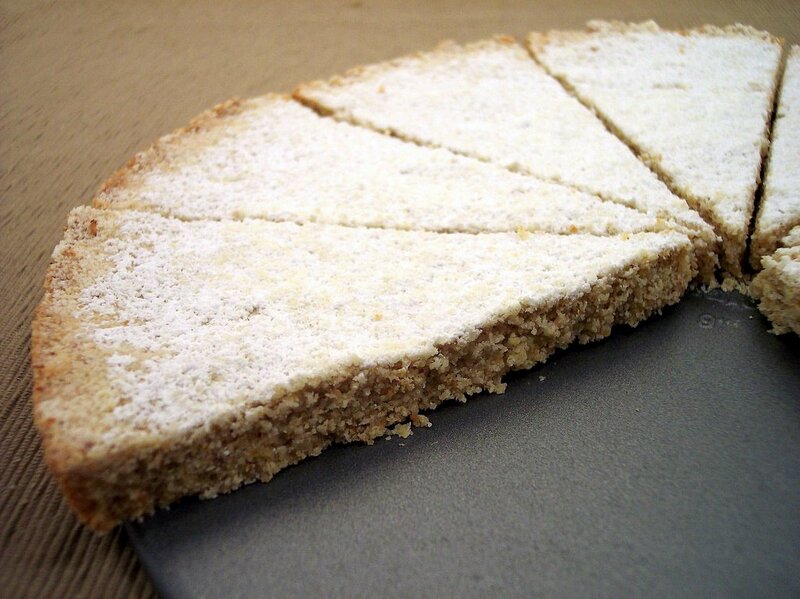 If you don't have Rice Krispies around, these would be just as good with crushed cornflakes! A couple dishes for dinner tonight. We started out with a take on creamed spinach. 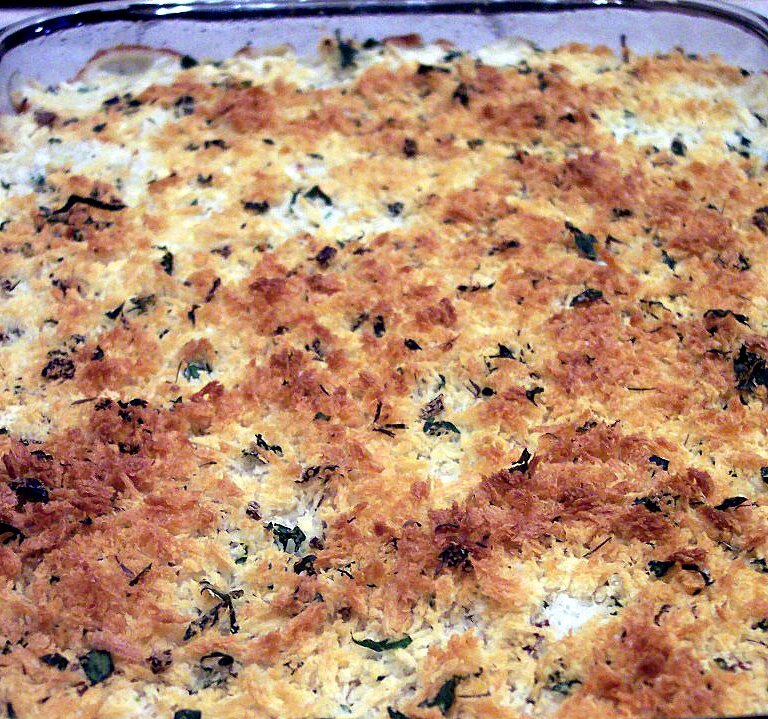 Individual Spinach-Asiago Gratins have a creamy inside which contrasts well against a crunchy panko crust. This was a first for us tonight (creamed spinach that is) and it took a few bites to get used to the texture. I'm not sure if I would have liked it as much without the panko crust on top though. 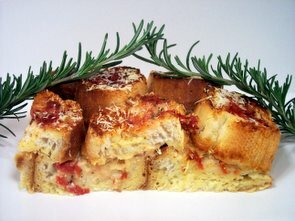 The asiago cheese punched up the flavor just enough even though only an ounce is used. Overall this was quite good once we got used to the texture! I also made Pan-Seared Pork Chops with Dried Fruit which was served over Whole Wheat couscous since it was pretty saucy. The original recipe called for a pre-packaged 7 ounce mixture of fruit bits, but I just chopped up what I had on hand. I used dried apples, cherries, pineapple, apricots and golden raisins. Once the chops are cooked, shallots are added and then chicken broth and the dried fruit. It is left to simmer, covered, for a couple of minutes so the fruit can absorb some of the liquid and plump up. The sweetness from the fruit went quite well with the tender and juicy chops. This is such a fast dish to prepare, so make sure you have everything ready to go and it can be made in just minutes! When I'm searching for or coming up with a recipe, especially sweets, I love to seek out unusual spices or ingredients we don't often use. Today's cookie is pretty different than what we have made in the past by the combination of ingredients and the method used. Cardamom-Lemon Polenta Cookies are firm, dense and have a toothsome texture from cornmeal. I only had white cornmeal on had, but you could certainly use yellow. The cardamom flavor is very upfront in these wedges with a subtle nuttiness coming from ground toasted almonds. I couldn't so much taste the lemon zest, but felt it just enhanced the rest of the flavors coming through. Cardamom is a pretty strong flavor and could easily become overpowering so measure carefully here. 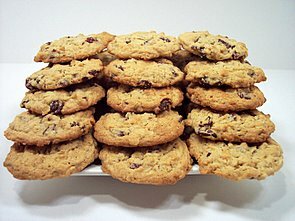 The cookies come together easily in the food processor which make these quite fast to prepare. As the cornmeal brings a bit of crunch and makes them on the drier side, I think some macerated berries would be perfect to serve on top. We have made a couple broccoli filled pies before, but the one we made tonight moved right past them to become a favorite. 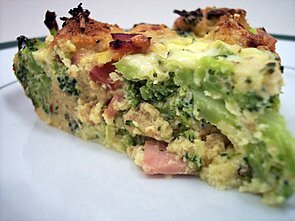 Broccoli-Cheese Pie differs from the others as it has a crunchy panko coating on the outside and the egg mixture soaks with cubed whole wheat bread to add a heartier texture. Lean Canadian bacon lends a smoky flavor that goes well with just enough spice from Frank's Red Hot sauce. Pancetta or ham would be a good substitute if you want to use something else. Not as many recipes this past week as we normally make - 8 this time, with the stand-outs being the Creamy Key Lime Bars and Peanut Chicken Soba Salad. I have the week ahead planned out and I will be much more busy with recipes this week! Hershey's really seems to be cranking out the new limited edition candy bars these past couple months. 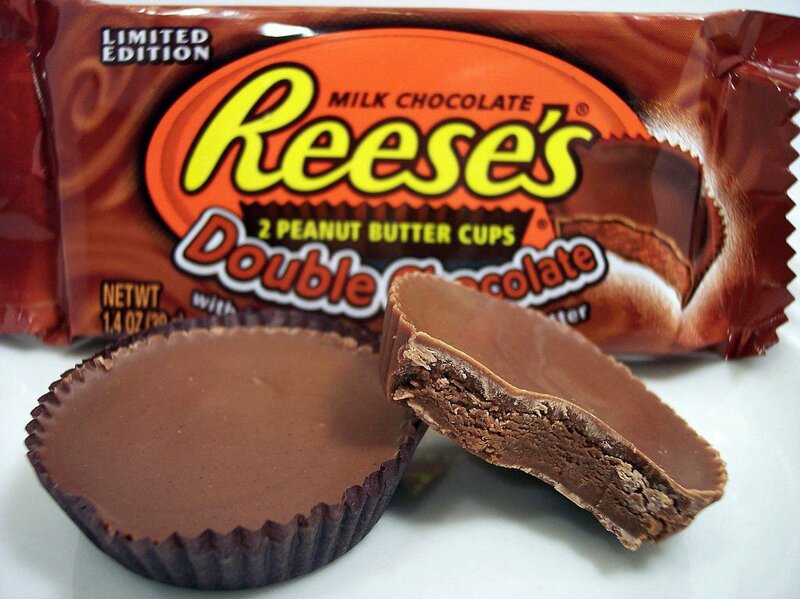 Last week we spotted the Milkshake Kit Kats and today we found Double Chocolate Reese's cups! 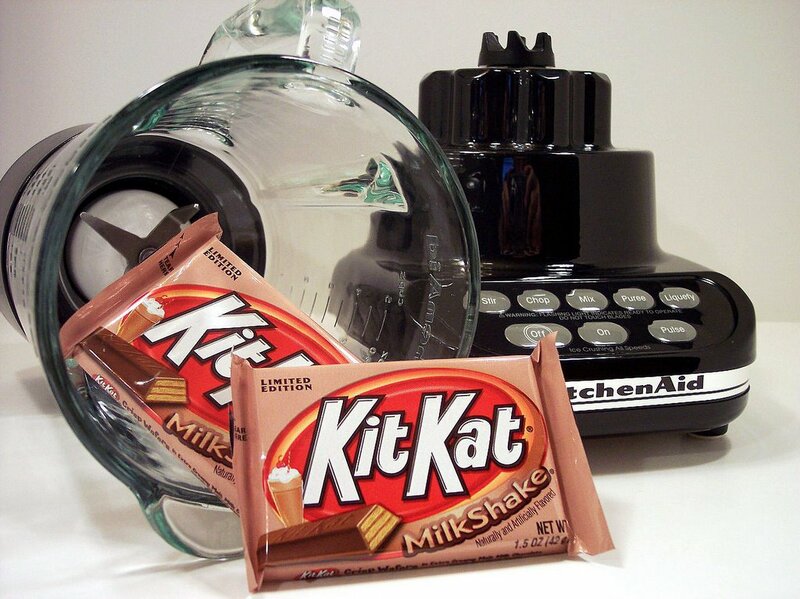 While I do love our homemade version we make of Reese's, this one is quite good. The filling is quite firm and is less peanut buttery, but not in a bad way. It reminded me a little of nutella, execpt made with peanuts instead of hazelnuts. When I was growing up, if I had a choice I always went for Reese's first - My favorite way to eat them is to have them slightly frozen and start by nibbling off all of the edges. Then I'll eat the middle last. So how do you eat your Reese's? 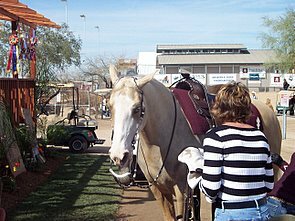 Yesterday after making the key lime bars, we went to check out the Scottsdale Arabian Horse Show. 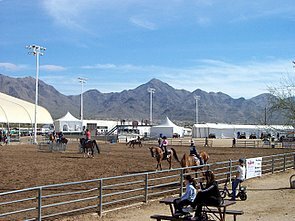 We were taken back by just how big this was - there were so many horses and quite a few events going on. 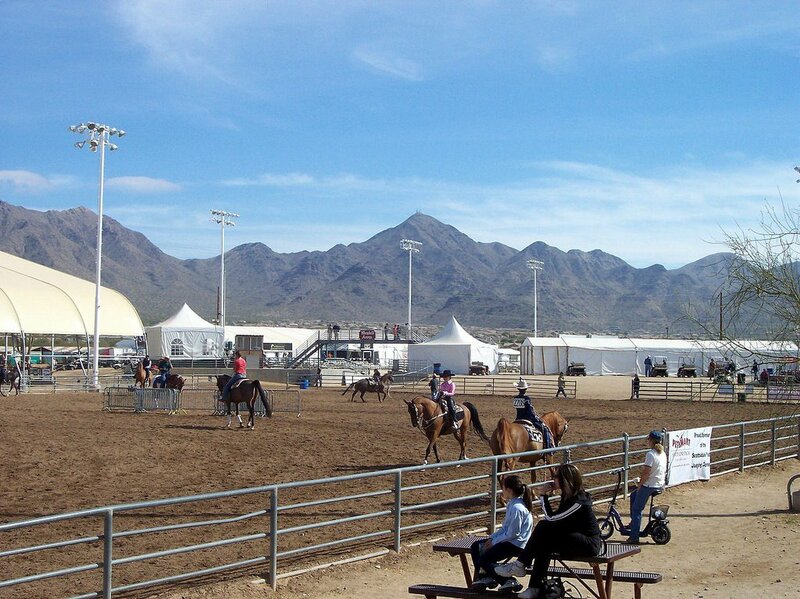 It was hard to pick out what to go see, but we went from arena to arena and watched to see all of the different horses. 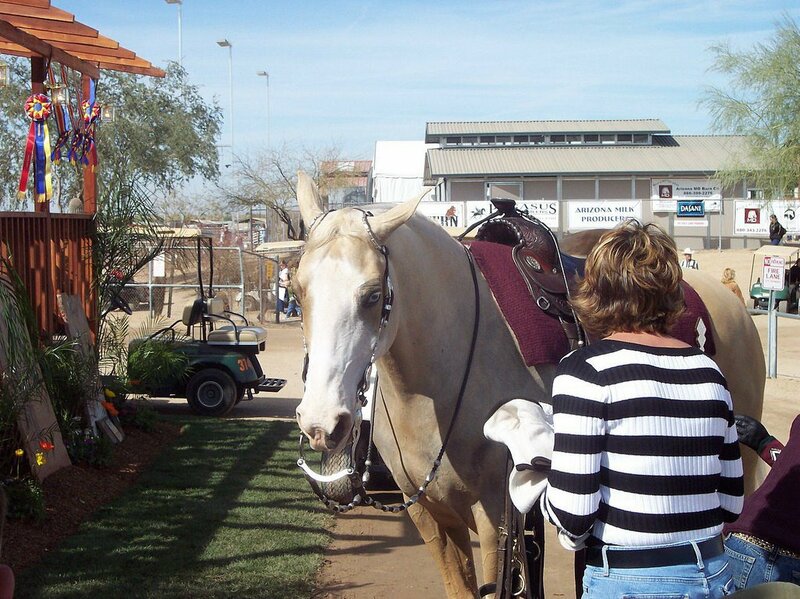 From the information they gave out, there were close to 2,000 horses from all over at this show. Quite the sight! If you are in the area, I would definitely suggest going to check it out, it goes until the 26th of February. Here are a couple shots... Netflix's movie of the night will be War of the Worlds with Tom Cruise and Dakota Fanning. We planned to see this in the theater, but we were less interested after the whole press thing with Tom/Katie and decided to just wait until the DVD came out. I love the refreshing taste that lime brings to many dishes. The small key limes are a favorite, but they can be a pain to juice and zest. The recipe today uses them and while you can substitue regular Persian limes, I suggest trying it first with the little guys. To make juicing a little easier, microwave them for a few seconds to get the juices going. 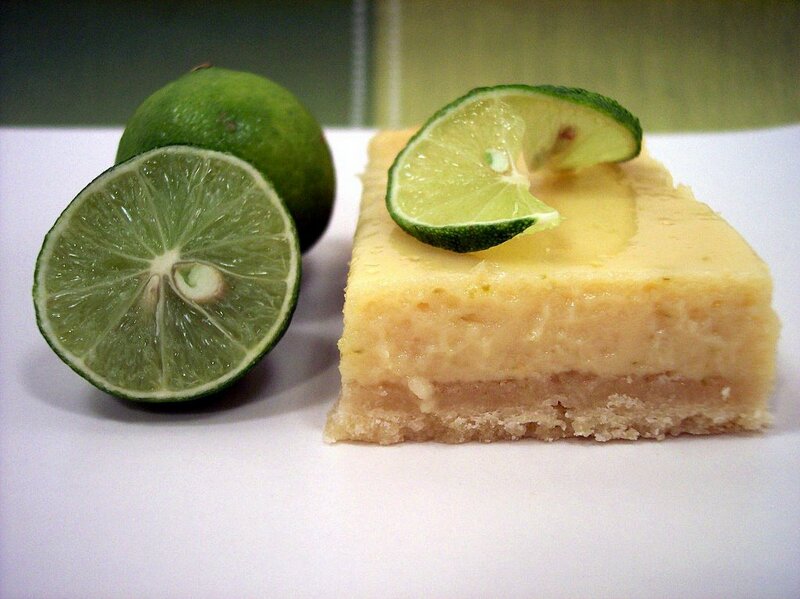 Creamy Key Lime Bars start out with a sweet buttery crust and a filling that is very reminiscent of cheesecake. 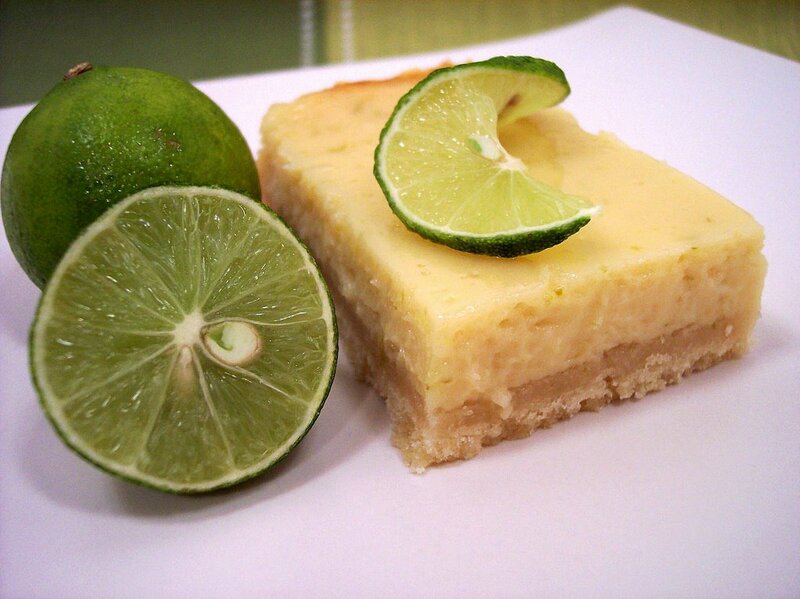 Key lime juice and zest bring an intense and slightly tart taste to the filling which the base helps cut through. There are not that many ingredients so it comes together pretty quick. It is baked until the edges are set, but the center still has a slight jiggle to it when you move the pan, similar to baking a cheesecake. Even though the filling remains a little soft, I found them to cut very cleanly. Tonight's DVD from Netflix is Tim Burton's Corpse Bride starring the voices of Johnny Depp and Helena Bonham Carter. I love his other movie The Nightmare Before Christmas, so I hope this one can live up to that. Lots of recipes to search through to pick out some goodies and dinner to make for the week ahead - I'll be busy after the movie as always! Check back and see what we are making next! Lookin' for dinner in a hurry? 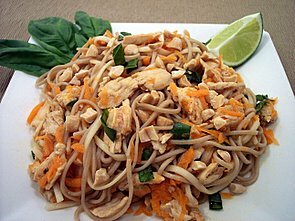 Tonight's recipe for dinner, Peanut Chicken Soba Salad, can be made in a snap and would be great for leftovers during the week as lunches. You could even speed up the prep process by buying a pre-roasted chicken or already shredded meat. What makes this meal is the sauce the chicken sits in. It may take some looking around to find it, but the roasted peanut oil is so worth it for this dish alone. The sauce has a bit of spice from chili-garlic sauce and some sweetness from honey. Crisp texture from fresh carrots gave a nice contrast paired with the tender buckwheat noodles. I liked using the fresh basil here, I found it to brighten up the flavors quite a bit. The salad is finished off with a sprinkling of crunchy chopped peanuts. I think the salad could take on a few more veggies to stretch the dish like snow peas or edamame. If you don't want to use meat in this dish, some cubed firm tofu would be a great alternative. Blogger seems to be having many issues lately - the site may load quite slowly today or not at all. I hope they can get these problems fixed soon! 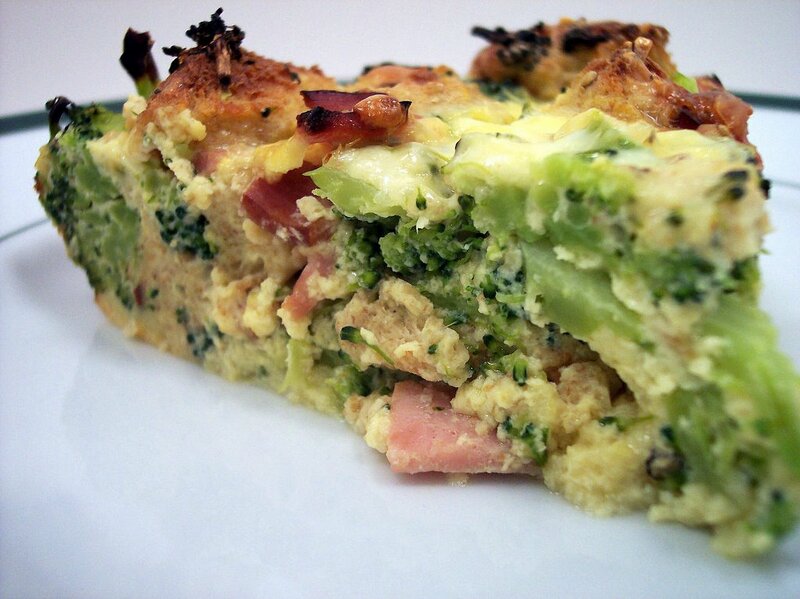 Tonight's dinner puts a healthy spin on a different type of omelet. Tortilla Española, also known as Tortilla de Patatas (potato and onion omelet), focuses more on the potato element in the dish, rather than eggs, like in an American omelet. 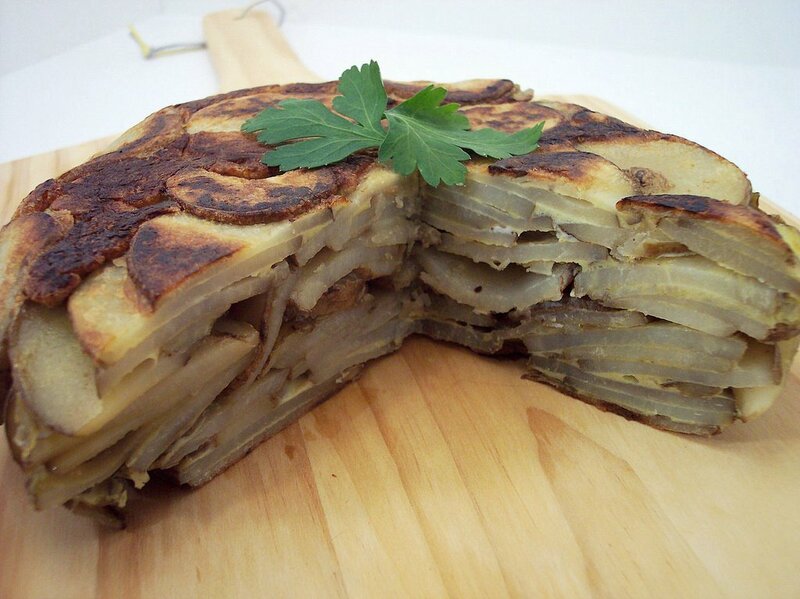 The ingredients could not be more simple - potato, onions, eggs, a bit of oil and salt. 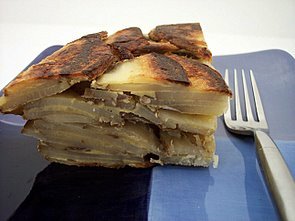 In the traditional version, the potatoes are fried first before assembling. Here we roasted them for about an hour with the onion and a very reduced amount of oil. This adds so much more flavor than if you were to just boil them. They are then added to the eggs and allowed to sit for a few minutes to absorb some of the liquid from the eggs. The trickiest part was flipping the potatoes back into the pan, but it held its shape much more than I thought it would! The tortilla is only cooked until the egg has a chance to set on both sides and to bring a dark golden crust to the outside. By making this in a smaller skillet, the appearance is quite striking when cut into - as you can see all of the layers. While it did hold together okay, I think it could benefit from adding one or two more eggs. This is best at room temperature rather than serving right out of the pan, so it would be a good dish to make ahead to serve to guests. This is our entry to the VRC that Biscuit Girl is guest hosting for Alysha at The Savory Notebook. Since the asparagus was on sale this week and looked extremely good, so I went looking for a recipe to use them rather than just steaming. 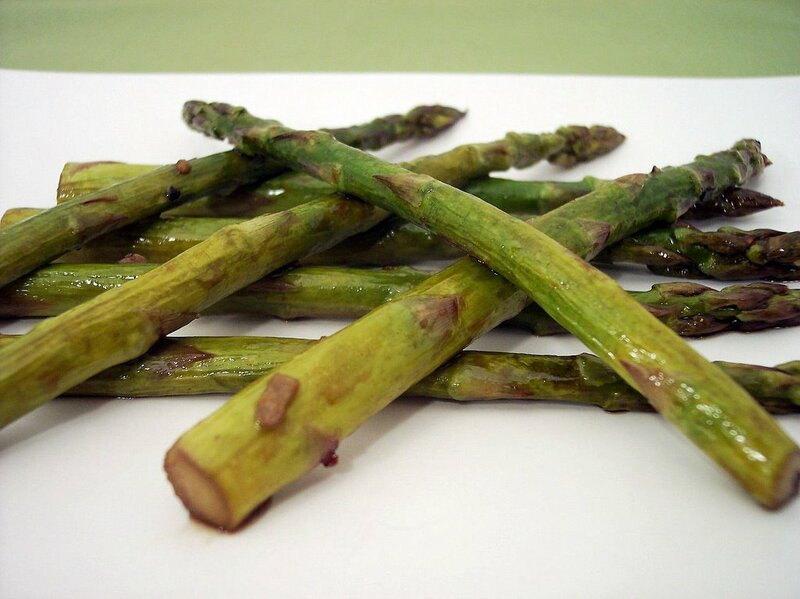 Balsamic Roasted Asparagus is now by far my favorite way to prepare this veggie. Very simply done by roasting them with some balsamic vinegar, olive oil, garlic, salt and pepper at a high temperature. I don't think I could go on enough about how much we liked this, they were so good! The asparagus we used was pretty thin, so if yours are much larger you might want to increase the cooking time by a couple minutes. This one will be repeated often! I didn't forget about them! 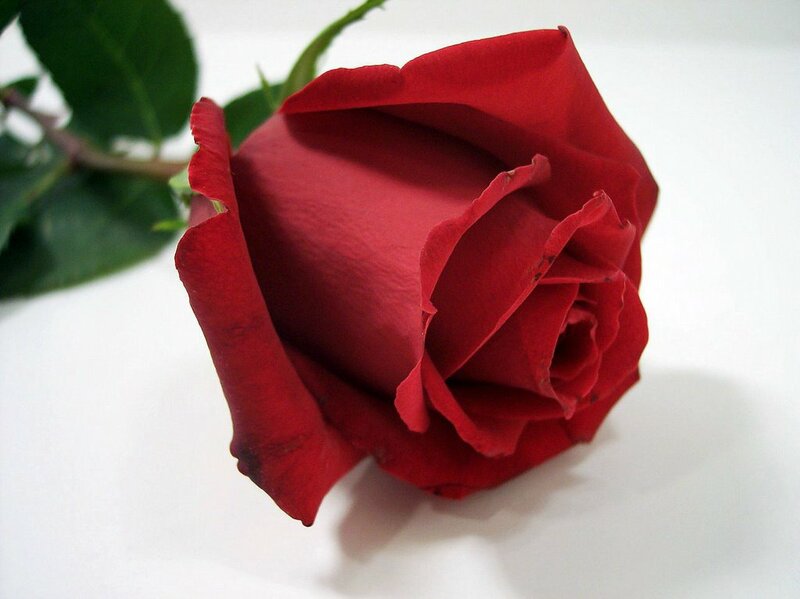 Since yesterday's post contained mostly Valentine's day related items, I decided to wait until today to talk about what usually happens on Tuesdays. If you came here yesterday to see what the Wednesday Treat that Jeff brings into his office was, no worries as I did make something! Iced Hermit Bars, another winner from Martha Stewart's cookie magazine, went over quite well today. 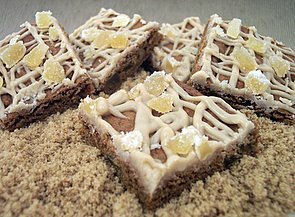 Rich and dense bars are filled with spicy chunks of crystallized ginger and golden raisins. The dough has many spices in it, including black pepper, that punch up the flavor so much. Using both dark brown sugar and molasses deepens the flavor quite a bit - but if your not a fan of heavy molasses flavor, I would use light brown sugar in the dough. The chewy bars are topped off with a free form drizzle of thick icing and more bits of ginger. If you love the sweet and spicy combo, these bars are for you. Tonight's dinner was a quick to make soup - Shrimp and Egg Flower Soup. 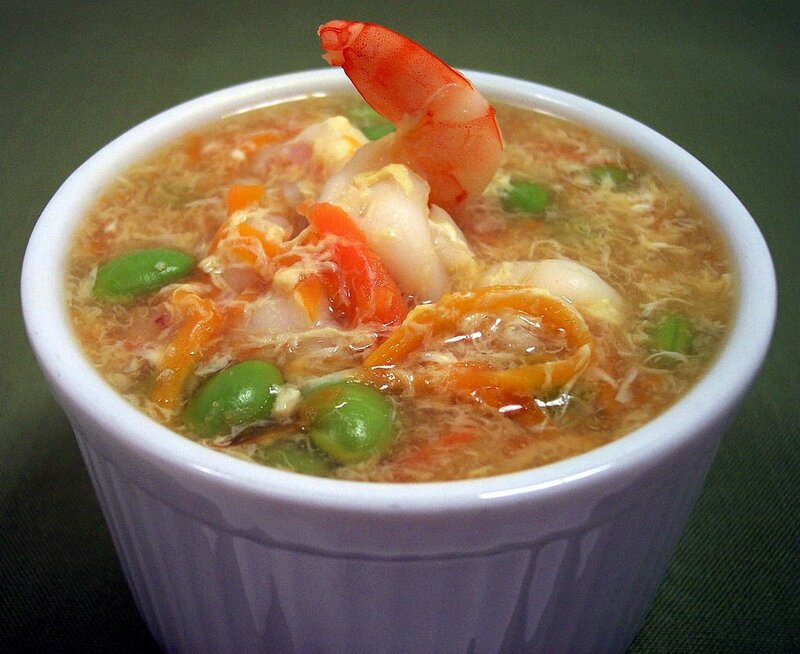 Chicken stock is the base and it is flavored with fresh ginger root, soy sauce, sesame oil and vegetables. The original recipe called for peas, but I replaced them with edamame as we normally do. The shrimp are cut in half lengthwise so when they cook, they curl into a fun spiral shape. I'll have to remember this for future soups as they looked pretty cool! Right before serving, beaten eggs are slowly drizzled in and are almost instantly cooked to create the "flower" effect. Next time, I think I would add a tablespoon or two more cornstarch to thicken it a bit and some chili-garlic sauce to bring some heat to the soup. I had a hard time choosing what dessert to make this evening to celebrate Valentine's Day. It had to be chocolate, but it needed to have just a couple servings or be freezeable. After sifting through cookbooks and recipes I decided on one that just sounded so good I had to make it. 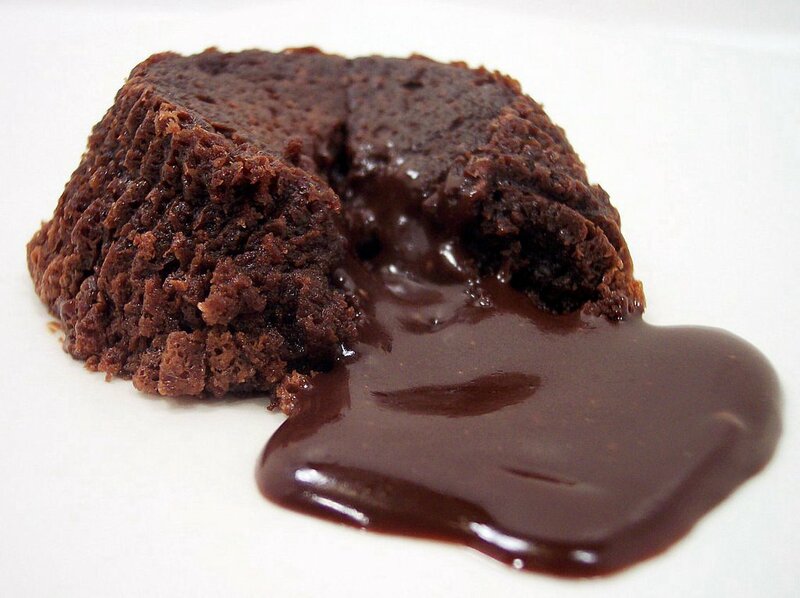 Spicy Mini Chocolate Lava Cakes are a flourless chocolate cake which gets its leavening only from beaten egg whites. While some lava cakes rely on underbaking to create a pool upon opening them this version uses a much better technique I think. 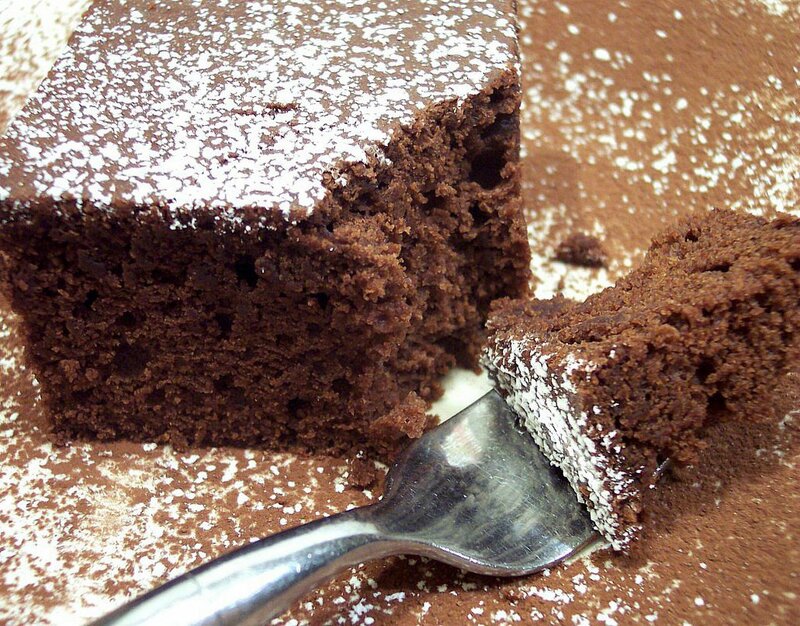 For the lava effect, you create milk chocolate truffles which are placed inside the cakes halfway through baking. Additional batter is then placed on top and allowed to finish baking. After a small cooling time, you invert them on to your plate and when the cakes are pierced open, the truffles have almost liquified and allowed to create a rich sauce that streams out. In the cakes, I added just enough Ancho chili powder to give the intense chocolate a boost in taste. These are small, but very rich and quite satisfying. Since these are made in muffin tins, rather than one large cake, you can easily refrigerate the leftovers and reheat for just a couple minutes in the oven to recreate the lava effect. There isn't so much a recipe for the dinner tonight, but I wanted to make one of Jeff's favorite dishes. The base starts out with baking a pesto-garlic tortilla into a bowl shape. 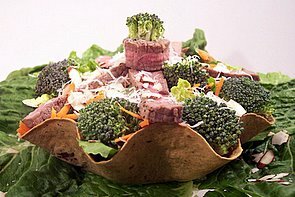 Layers of crisp romain lettuce, carrots, broccoli, sliced almonds and sharp parmesan cheese are placed inside. I then seasoned some steaks using the Classic Steakhouse Rub recipe and grilled them to medium-rare. When they have cooled a bit, I thinly sliced them and topped off the salad. We don't have this very often, but we love how all of the flavors work off each other. This is probably a little late as we have been writing in this blog for a few months now... but better late than never? Thinking back when I was younger, I have memories of trying to bake cakes or cookies and trying to help out Mom when I could (taste testing!) When I hit my teenage years, I was side tracked with growing up and dealing with the issues that come with that and lost interest in cooking/baking among other things. When I hit my 20's, I had grown tired of always eating out for most of our meals and remembered how much I enjoyed spending time in the kitchen. I started slowly and made a lot of mistakes along the way. Many of which we did eat (ugh.... not so good memories! ), but I've been getting better over the years I think. I've learned from reading many cookbooks, over the internet and picked up quite a few tips from television shows on PBS and FoodTV. I'm not a professional cook by any means, nor do I try to be. I certainly don't get paid to do this and I am truly just an amatuer trying to be the best I can. Do I someday wish to do this professionaly? Maybe, but right now I'm happy with where I am at. We send along pictures as we go, and while we don't have expensive equiptment we do strive to make them fun or interesting. They don't always look how I want them to, or they may be pretty plain, but that's just how it is. We enjoy playing with digital cameras, but soley on an amatuer basis - we do it for fun and learn as we go. I'm here to share the recipes we try (be it a success or failure), new products we might find and our adventures in the kitchen. 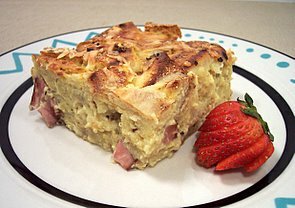 If you happen to come upon a recipe you haven't tried and love it, great! If we talk about a product we bought that you didn't know was out there, cool! I still have a lot to learn, try some of the many foods we have not eaten, and I'll share some of the tips and tricks we learn as we go. We're always open to input, tips and suggestions! So if you are still with us, let's get to dinner! We have made quite a few casseroles or stratas that call for cubed bread, using sourdough or french. Tonight's dish, English Muffin Strata with Ham and Cheese, uses these firm and spongy-on-the-inside muffins. I used a Whole Grain version we've seen in the store before - it added a nutty flavor and a more hearty texture. They are first split, cut into wedges and then half of them are placed in the bottom of a baking dish. Salty Canadian bacon and rich Swiss cheese are layered over and then the remaining wedges are arranged on top. This is left to soak in a slightly spicy mixture of plain soy milk, eggs, mustard and cayenne for a few hours. After the trip in the oven, the mixture puffs up from the eggs and a crisp outside crust forms on top. The inside is firm, but a bit creamy from the amount of liquid. This will make for an excellent lunch tomorrow. As another week passes, we made a total of 11 new recipes. I will be interested when we hit our one year anniversary with the blog to try and get a total of how many new recipes we made during our adventures here. 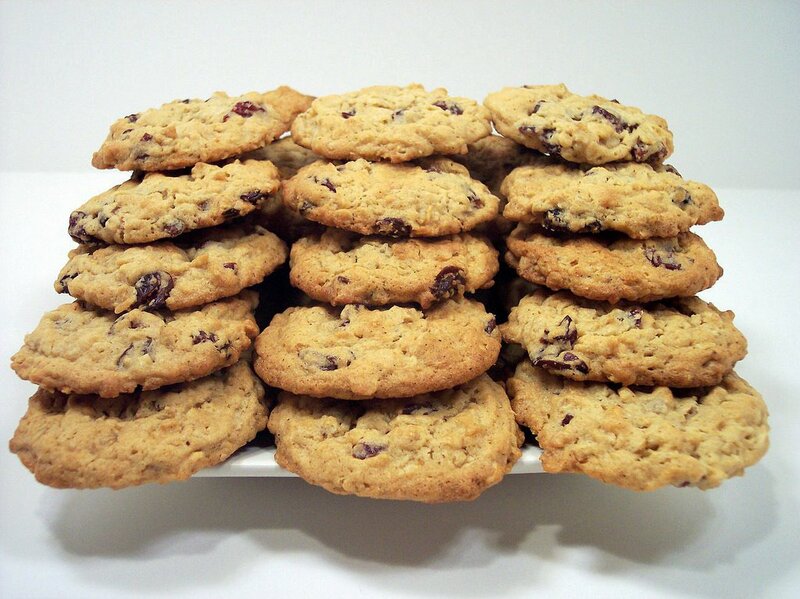 Our favorites this week were the Root Beer Float Cookies and Cherry Peanut Butter Oat Cookies. We don't typically buy candy bars very often, if we have a taste for something we sometimes try to recreate them. When we do buy some, it is usually because it is something new or a different flavor in a favorite candy. The last one we tried was a coffee flavored version of Kit Kat Bars. They were awesome, but limited edition and we only saw them once in the stores. At the store today, we saw they came out with another new flavor so we jumped at the chance to try this one. 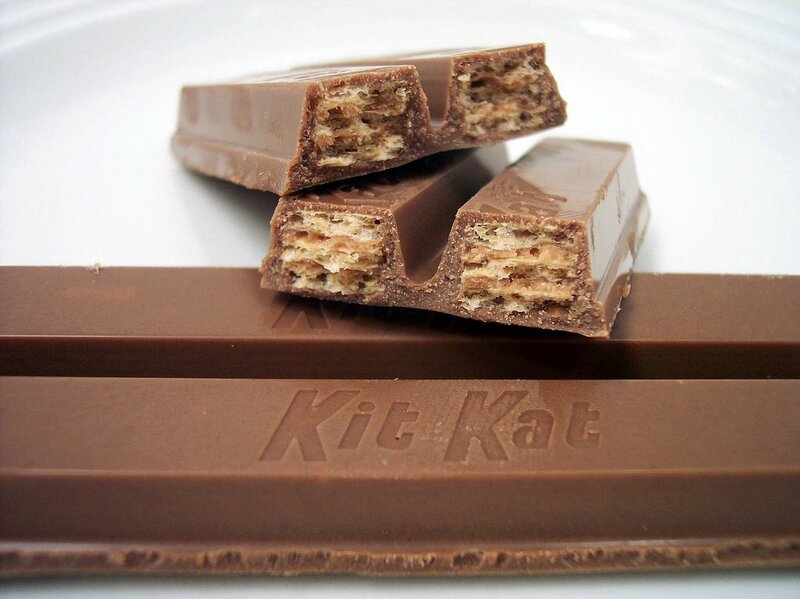 Milkshake Kit Kats! The milkshake flavor comes from the outside where a creamy malt flavored chocolate coating coats the classic crisp wafers. If you like chocolate malted flavor (think ovaltine or carnation), these are right up your alley. Sometimes ingredients you would not normally use in a recipe can create unique and tasty treats. Today's cookie won me pretty quickly and I was happy how the flavor stood out. I had someone taste one and without telling them what what in it I got a responce of "This tastes just like.... Root Beer?!" Root beer float cookies use that robust flavor in two ways, inside the cookie and the icing on top. 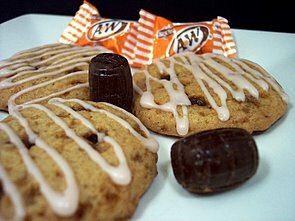 The main jolt of flavor comes from crushed A&W root beer barrels which are blended into the dough - the smaller pieces melt into the cookie and the larger ones create pockets bursting of root beer. This is a firm and chewy cookie with a sweet glaze on top. Confectioners' sugar is thinned out with just enough root beer to make a glaze that can be easily drizzled over each cookie. To add some more texture to these, you could sprinkle more of the crushed root beer barrels over the glaze before it sets. Yes yes... I know... more muffins! Jeff and his co-workers have to work tomorrow starting at 5 am to do some testing and he thought it would be nice to bring something to munch on. They are going to already have normal breakfast fare, so we decided on some muffins to make and bring in. 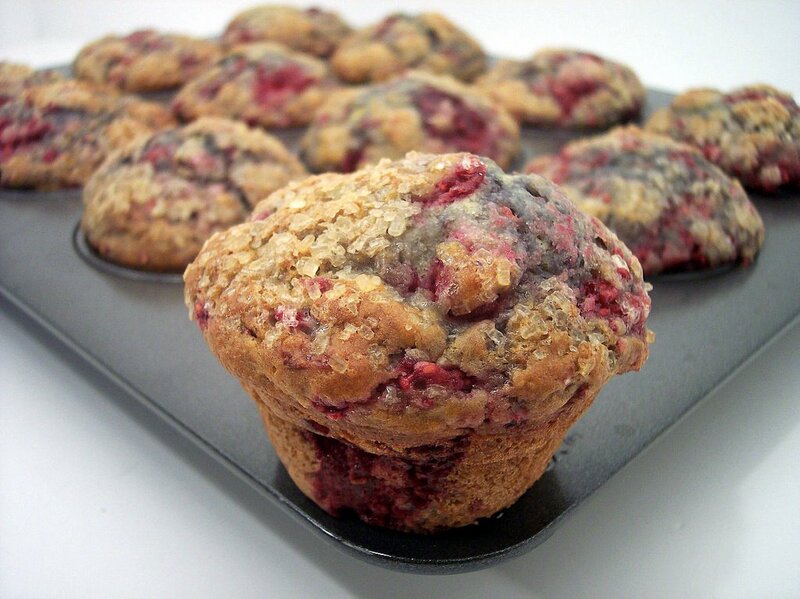 Raspberry Lemon Muffins are moist with a bit of crunch on the top of the big mushroom crowns coming from raw sugar sprinkled on before baking. These are just your typical muffins, flavored with lemon yogurt and zest, with some raspberries folded in. I used frozen berries, so while I was mixing them in they did defrost a bit and turned bits of the batter a funky purplish color! I probably should have used muffin liners, but didn't think about it at the time. In a couple muffins where raspberries were on the outside they wanted to stick, but they did pop out after sitting for a few minutes. I might try these with all pastry flour next time just to see the difference in texture. As I mentioned earlier in the week, I bought some dried cherries at Trader Joe's for dinner tonight. 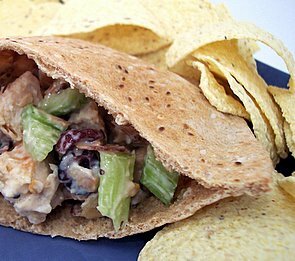 Dried Cherry-Toasted Almond Turkey Salad Sandwiches have lots of flavors mixing to create quite a tasty meal. Nutty whole wheat pitas take the place of sandwich bread to hold in the turkey salad. The binder is a mixture of sour cream and plain yogurt spiced with ground ginger and crushed red pepper. Crisp celery adds a nice crunch along with the toasted almonds. 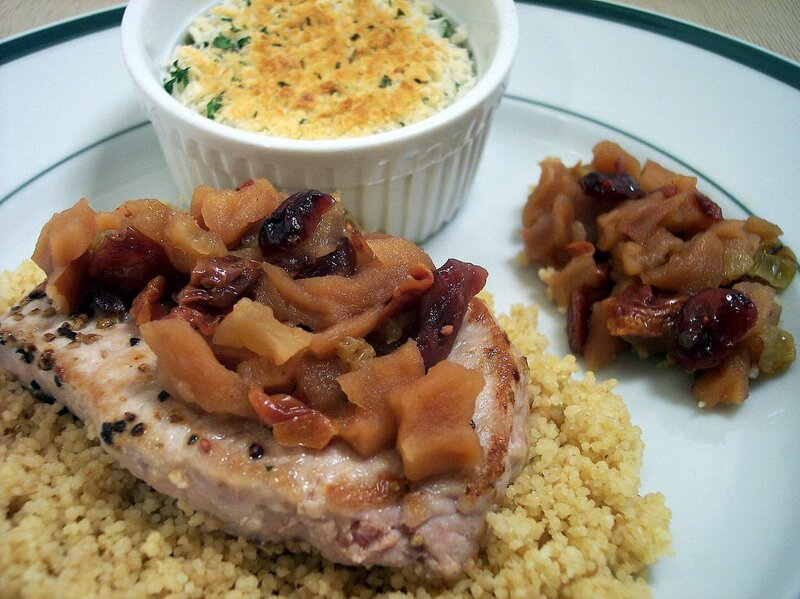 Dried cherries and golden raisins mix well with the chunks of juicy turkey breast. 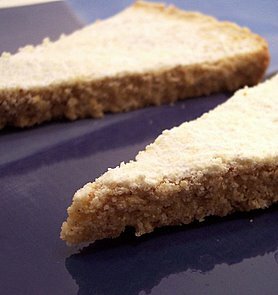 The meal was quick to make and not as messy to eat as with sandwich bread... I served some baked tortilla chips along side to complete the meal. Sometimes when I'm after a chocolate dessert, I don't want something that is heavy or dripping with icing. 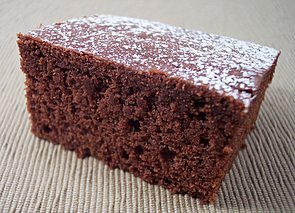 While that kind can certainly be fantastic all done up, I also like ones that are light, portable, quick to make and full of deep chocolate flavor. This Chocolate Snack Cake had everything I was looking for. The cake is pretty quick to prepare, would be great to pack along in a lunch and has a satisfying chocolate flavor. Using dutch cocoa lends a deep rich chocolate taste without the bitterness that sometimes can be found with natural cocoa. This makes nine generous portions which are quite moist. All it needed was a dusting of confectioners' sugar and I was pretty happy. Lasagna was for dinner tonight, execpt this was not your typical kind. Polenta Lasagna has layers of sliced polenta, cheese, and a vegetable/meat free sausage marinara mixture. You could certainly use ground beef or chicken, but I liked being able to lower the fat some by using gimmie lean sausage. Instead of using the pre-bought polenta in a tube (which is just fine), I had a bunch of cornmeal already on hand so I made some polenta last night and let it firm up in a baking pan in the refrigerator overnight. I used a round biscuit cutter to then cut out the disks. 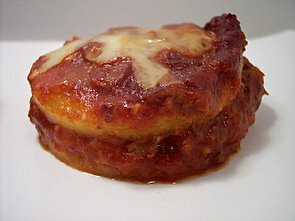 While it does not have the same texture as lasagna, the rounds did keep their shape well and absorbed a lot of the flavor. Next time I might try searing the polenta disks first to give them a bit of a crust before layering them. The dish was so flavorful - I loved this twist on lasagna and will make it again. A few years ago before we started eating better and when we were both quite the picky eaters, one of the few things we would have frequently was chicken strips. I have not made any for the longest time because I had grown quite tired of them, but I spotted a recipe that looked like it might be the one to win me over again. The recipe, Golden Nuggets, had a few things going for it right off the bat. The chicken is first marinated in a flavorful mixture of buttermilk, lemon juice, and spicy seasonings. What sets these apart from plain old chicken nuggets is the coating. 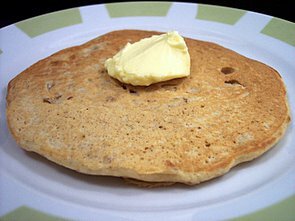 Instead of regular breadcrumbs, Whole Wheat English Muffins are placed in a food processor and processed until they turn into smallish bits. Fresh grated parmesan cheese is then mixed in and then this is used to coat the sliced chicken pieces. After being baked, the chicken was juicy and the crust turned into a crisp golden brown coating. 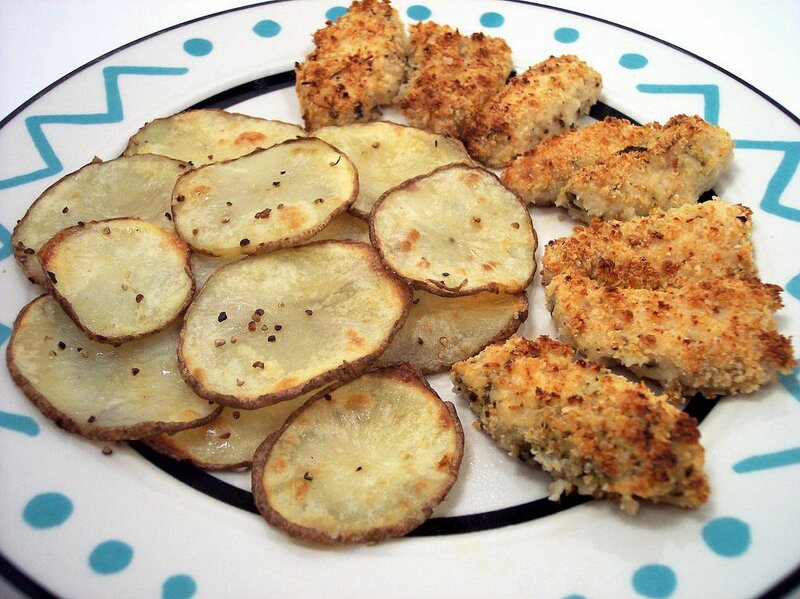 Next time I have a hankering for chicken strips, I know what recipe I can turn to! 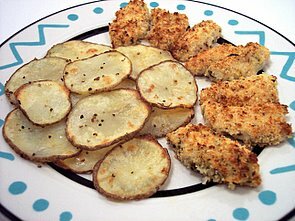 To go along with these, I cut some potatoes into about 1/8" thick slices and then soaked them in some cold salted water for awhile. I then tossed them with some extra-virgin olive oil, salt and pepper. Next, we baked them at a high temperature until the insides were tender and the outside just started to get crispy. It's baking for Wednesday Treat day today! I mentioned that I was going to use some fresh and dried fruit in my weekend post for the treats Jeff will bring in to his co-workers. At first look the recipe that used them didn't seem too bad and I figured I should be able to get them done fairly quickly. Boy was I wrong! 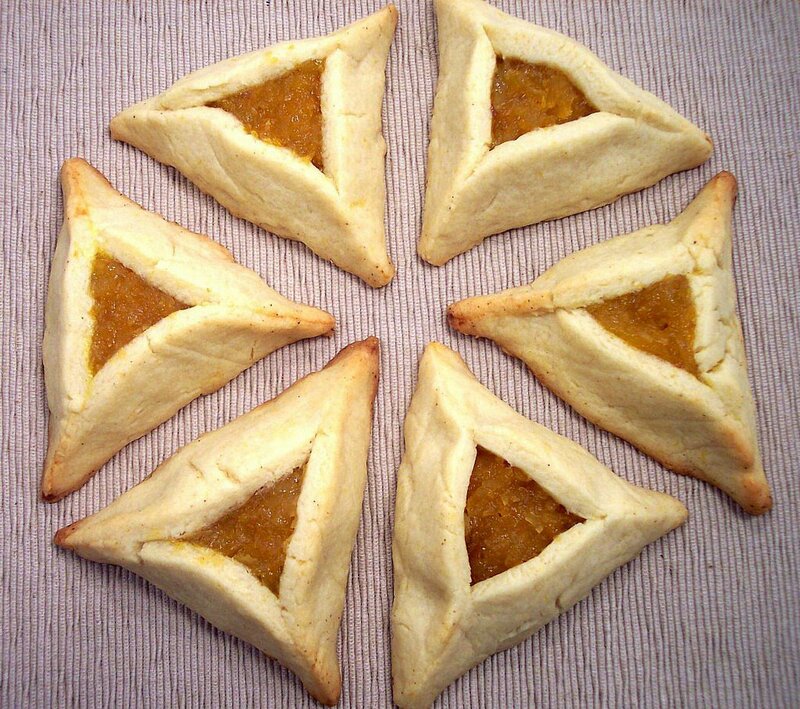 Hamantaschen are traditionally shaped like a tricorner hat and would have a classic filling of a poppy seed mixture. While this recipe keeps the shape, what fills them inside is quite different. The fruit filling is a combination of golden raisins, apricots, honey, apples and apple juice. This is cooked down until very thick and it slowly starts to break down into a chunky mixture. My main issues were with the dough- I'm not sure if it was just me or what, but it seemed pretty tough to work with. I tried keeping it at different temperatures to see if that would help, but it didn't seem to make much of a difference. I had some problems with it cracking and trying to keep it smooth while shaping. It took me a lot longer than I had planned between the filling and shaping of each disk. Once the filling has cooled, it is placed in the dough circle and the sides are brought together to form a large triangle with the center remaining open. When they are removed from the oven, they are a little soft, but as they cool they crisp up. The cookie has a lemony taste and is quite buttery. The filling sets up and has mildly tart and tangy flavor. A quite healthy pancake, Maple, Walnut, and Flaxseed Pancakes, was our Breakfast for Dinner meal tonight. Using whole wheat pastry flour and ground flaxseed makes them more nutritious and filling. They are light, airy, slightly sweet and very nutty. The baked-in pure maple syrup is the sweetener and lends enough extra flavor where you wouldn't even need to pour on more. We had these with a bit of Brummel and Brown on top and it was just right. Though I do admit, I bet these would be even better with some Golden Syrup drizzled on top. I picked up some dried tart cherries at Trader Joe's this weekend and only need a few of them for a dish later in the week. Since I knew I would have a bunch leftover, I thought I would use up a good portion of them in a cookie. Cherry Peanut Butter Oat Cookies have a slightly crisp outside, are quite chewy and have a toothsome texture from the rolled oats. When I was going for the first bite, I was surprised by the intense peanut butter aroma. The first taste was a rush of peanut butter followed by chewy tart cherries. 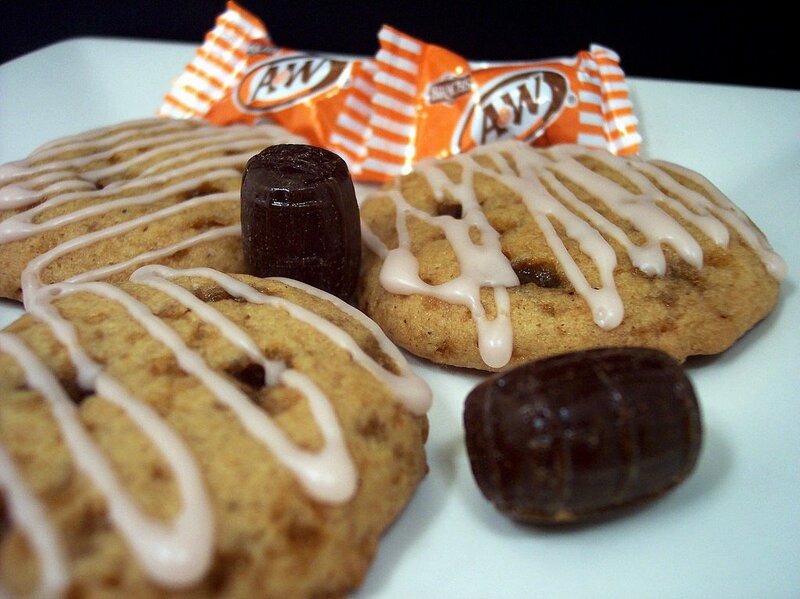 The three flavors meld well into a hearty cookie. 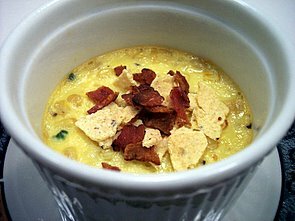 The first part of dinner tonight was an interesting savory custard, Individual Corn Custards with Bacon-Potato Crust. These creamy individual cups pack a bit of heat from diced jalapeños. Some of the corn and milk are pureed together to bring thickness to a mixture of milk, eggs, and flour. The rest of the corn is sauteed until lightly brown to give a roasted taste and some chunky texture. The custard is baked in a water bath until just set in the center. A mixture of crispy bacon and baked chips is sprinkled on top and broiled until a golden brown. Broccoli Chowder accompanied the above custards to finish out the meal. We both agreed that this soup was an exciting addition to our recipe file. This comforting dish was creamy, rich and quite satisfying. Onion, carrots and celery are cooked with potatoes and garlic to create the flavorful base. 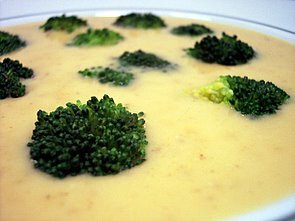 The broccoli is added in two stages - first the stems are thrown in so they have a longer time to soften, and then the florets to cook until tender. Finished with sharp white cheddar and sour cream, the soup ranks right up there among our favorites we have tried so far. Can the lighter side be just as good?